Spring weather is certainly making it's presence known here with abundant showers, forceful April winds and cool in the shade temperatures. The trees and shrubs are budding into leaf and blossom, albeit battered by the wind and rain, they seem to be clinging on and setting fruit. The worst affected are the cherry trees as they were in full bloom just as the weather showed its full force. The mood here is Spain is subdued with the growing problems of the economy and the increasing number of unemployed. The young seem to have little chance of meaningful employment in the short term and reports suggest that those who are able to seek work abroad are leaving Spain to seek a career elsewhere. The long-term consequences is that we lose a generation of capable people who could help Spain in its long term recovery. On a positive note, it seems austerity measures have prompted more people to cultivate their land and increase livestock which is a good move and brings a bit of life back into the rural communities. The vegetable beds are now raised with borders of sturdy planking and a few tons of sandy rich soil have been added. Peas, sugar snap peas and mange tout are growing well despite a slow start and the 100 potatoes and 400 red and white onions are looking strong and healthy. Seeds have been sown and pricked out, and the young plants are looking OK considering it is cooler than normal. We have just harvested the last of the leeks and there is very little purple sprouting broccoli left which is a shame as it has been particularly tender and sweet this year. The rhubarb plants are doing well and we harvested some to make our first fruit leather in the dehydrator. The leather was made of rhubarb, banana and honey. Imagine a really chewy soft fruit with an intense taste - different but definitely worth making. I will make it slightly thicker next time but for a first attempt it was great. Wild boar have once again struck down at the bottom of the garden in the wild area. Apt I suppose. They lift the turf looking for the bulbs of orchids and bluebells. It looks a bit of a mess but soon repairs and reverts back to meadow. This time we think it/they came over the drystone wall as a part of it is collapsed - but that could have been the storms. Wentworth the cat has been in trouble again in a fight against one of the semi-feral cats around and about. He came home one afternoon obviously worse for wear. We know from past experience the sequence of events and it is heartbreaking to see him develop an abscess from a bite and become subdued and in pain. This time it was his front left paw - it became swollen and he could not weight bear. It takes a while for an abscess to form but this time it was taking a bit too long so we took him to the vet who prescribed antibiotics and pain relief. Together with foot baths three times a day, the abscess has now burst and left him with a very sore but less painful paw. I have kept him in for a few days as he was truly incapacitated and defenceless. He has been out for a couple of hours this afternoon in the sunshine but he is now back in the house and resting. Cats are quite resilient and he'll soon be back to his mischievous self. There is something quite off-putting about using commercial cleaning products that glow. Their pungent added aromas are usually over-powering and nauseating, they are full of chemicals and have the ability to strip your hands of any natural oils and eventually dissolve your fingers (well almost), consequently they do not come high up the list of products we want to use. We have always worked towards developing and using more natural products to keep our home clean and bug free...and it seems to be working. Well we haven't come down with the plague yet. The main ingredients we use as cleaning products are: Distilled white vinegar; Bicarbonate of soda; Lemons; Essential oils; Natural soap; Water. Lemons grow plentiful around here and our favoured supermarket now stocks white vinegar for cleaning. In our basic cleaning kit we have: the anti-bacterial qualities of vinegar, lemon juice, salts and oils; degreasers in the form of soap, lemon and vinegar; abrasives in salt and bicarbonate of soda; dirt removal in soap and salts; antiseptics in essential oils and lemon juice. All of our floors are tiled or wooden floors here at La Pasera and we have three bathroom areas and a kitchen that is also fully tiled. Hot water, vinegar, soap and lemon in a weak solution takes care of most of the floor and tile cleaning. Bathrooms are cleaned with much the same solution but in a stronger mix. Vinegar is great for removing lime-scale and as we are in a hard-water area, we soon get a build up if we don't clean it off regularly. Bicarbonate of soda or salt help remove stubborn stains that need mild abrasion. A weak, dryish polish of water and vinegar will shine and degrease chrome work and stainless steel. Windows are cleaned with a spray made of water, natural soap and vinegar - polished with newspapers like my Great Grandma used to do, they sparkle in no time. addition of 100% alcohol, fragrant herbs, regular aeration of the house and The Towers (the garage, storeroom and studio), we only occaisionally have the need for bleach and/or a commercial cleaner. 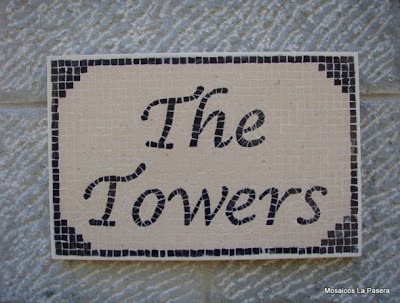 You might be curios as to why we have named the Towers as such. Those of you who have visited us will know that is isn't a small space and it towers over the garden from its rear aspect - hence The Towers. We are still using commercial detergent for the washing but we have cut down the amount by making a 50/50 mix of commercial powder and grated home-made simple soap (by Rita, Luis' Sister). Tackling and thinking about what we use in the dishwasher is the next job in hand. There are a few recipes out there on the web for home-made dishwasher liquid, I'll investigate unless you know of one that works? We would love to hear about your home-made cleaning products and hear about any cleaning tips - whatever makes life simpler... Get in touch or leave a comment. Cycling in Asturias: The challenge of cycling to the mountain lakes. Asturias is a beautiful region with a dramatic landscape where you are never very far away from the coast, luscious green valleys and the majestic Picos de Europa Mountains. Setting off cycling from La Pasera to the surrounding villages is a flat and enjoyable ride and if we go further afield along the coastal plains it starts to require a certain affinity for cycling up and down hills and mountains. When we first moved here I disliked venturing further afield due to a lack of fairly flat terrain and well defined off-road paths. Cycling along tracks where you have to get off your bike and carry it for a considerable length of time as it may be too rough even for a proper mountain bike, is not my kind of cycling. Eventually I decided to limit myself to cycle along the numerous rather quiet lanes and roads where coming across other vehicles is rather infrequent. Spanish drivers seem to be well-used to cyclists on the road and the driving code stipulates that a cyclist has the same rights as any other car on the road. I remember when we frist drove up to the Picos de Europa mountain lakes (Lake Ercina and Lake Enol) in the car and spotted a professional looking cyclist who was steadily gaining altitude. I remember thinking then that such strenuous cycling would not be enjoyable. Overtime...I started cycling up some of the easier mountain routes and I started to see cycling up to the mountain lakes as a possibility. After some weeks of training, I have recently cycled up the lakes for the second time, some would say I am a glutton for punishment. During my training I cycled to one of my favourite beaches in Asturas, Torimbia. Once you reach the car park and before you start walking down to the beach it is worth stopping a for a while to admire the beautiful views of the Asturian coast with its dramatic cliffs and golden beaches. Further training saw me cycling on the coastal road to the West which took me toward El Fito viewing platform at an altitude of about 700 m that offers some magnificent views of the coast and of the Picos National Park. Once I'd cycled up El Fito I knew that physically I was ready to undertake the challenge up the lakes. It is one of the toughest challenges within the "La Vuelta" or the cycling tour of Spain. This cycling route up to the Lakes of Covadonga entails a 1056 m ascent over 12.6 Km that starts at the base of the sanctuary of Our Lady of Covadonga. As I commenced the climb I cycled under the shade of the luscious mixed perennial woodlands that had started coming into leaf whilst the ground was a carpet of colour provided by the wild flowers, grasses, mosses and lichens. Concentrating on the flora and the sounds of the numerous songbirds is an interesting distraction from the physical hard work and the rising body temperature from hard cycling. Eventually the clearings in the woodland became greater as I continued cycling up the road but now the vistas across the green valleys are stunning and for a short while I almost forgot how tired I was becoming. Cycling on up the road, the mountains start towering on my left while ahead of me I noticed the distant cars climbing the famous La Huesera section, 800 m with a 15% gradient that I needed to tackle as I reached the half-way point in the climb. Psychologically, it is the toughest section but thankfully, numerous people cheer you up as they drive past. God knows what they think as you brave a smile trying not to loose concentration on reaching the bend on the road ahead of you. After La Huesera you hope for the lakes to be just around the corner while at the same time you know that you only just passed the halfway mark a short while ago. The alpine flowers I encounter on the roadside are like eye candy whilst I considered if there is the energy left to continue the ascent. Eventually the mountain peaks start appearing closer and closer with every bend I conquer, until I eventually cycled around a massive rock to a first glimpse of Lake Enol which greeted me with its waters reflecting the rocks and greenery that surrounds it. At this point the sense of joy and achievement starts setting in as I know it is only a few more hundred meters before I will reach Lake Ercina where I can draw breath and admire the snow covered peaks reflecting in the water. I usually ask one of the numerous people visiting this beauty spot to take my photo as I try to control the big smile that I hardly can contain. After a much deserved rest, it is a matter of starting the free ride back down while keeping a good hold on the breaks to prevent the bicycle getting too much speed. You can never forget that the impressive views come with significant drops on the side of the road. In total, this circular ride from La Pasera is about 95 Km and a refreshing shower is always much appreciated before relaxing in the garden with the cats playing in the grass. 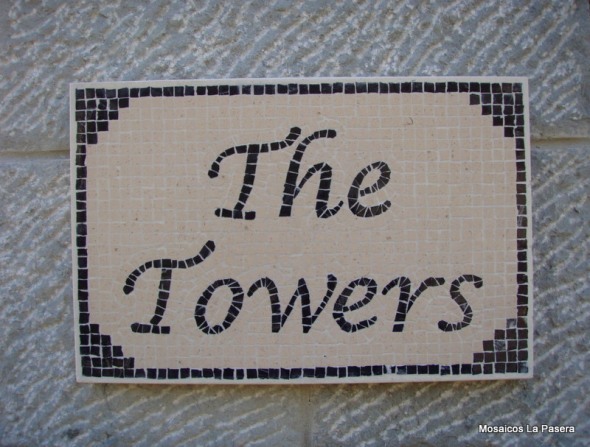 This mosaic was commissioned by a Bollington resident, Bollington, Cheshire, being the home of the White Nancy. Luis took the inspiration from a black and white photograph taken in winter. The Photographer was consulted and the subsequent mosaic took shape. Needless to say the recipient is thrilled with the result. The original photograph can be found here: White Nancy (Luis chose to leave out the graffiti). Preserving food naturally - The new dehydrator part 1. Whilst in the UK we purchased a nine-tray Excalibur Dehydrator. It is something we have considered buying for a while now. The discussion as to buy or not really focused on likely usage of the dehydrated fruit, vegetables and herbs we would produce. We currently freeze much of our excess for the garden or make soups, jams, chutneys, sauces and stews for use throughout the year. We also bottle many things such as peppers, beetroot and chillies. After chatting to several people who use dehydrators and reading articles about dehydrated food and raw food we decided that it would compliment our current efforts to grow the majority of our food, chemical free and as naturally as possible. Dehydrated food has a long, long history and as a method of food preservation, has been proved to be an effective way to store excess for use throughout the year. Although there is an initial cost in drying the products, unlike a freezer, once stored, the food requires no further energy use. On the hole, enzymes are preserved much more efficiently than other methods of preserving. Vitamins, minerals and natural occurring sugars are also maintained with the exception of some vitamin C and A which can be lost if stored or dehydrated incorrectly. So what are we going to do with it? Fortunately the dehydrator came with a free book that explains the basics and provides lots of ideas for use including making fruit leathers, dried fruit, vegetables and herbs, how to make cottage cheese with it, dehydrating raw foods to make a range of biscuits and crackers...and so on. We will definitely be making fruit leathers and plan to use them for walking trips as a snack. Throughout the year we get a glut of certain fruit and vegetables so we will be trying to dehydrate most things except brassicas and lettuce which apparently do not dehydrate well. Luis wants to create root vegetable crisps which sounds yummy and I might have a go at creating my own seaweed based crackers. Watch this space, more reports coming in the near future. If anyone out there uses a dehydrator, we would love to hear from you and hear about any tips you have learnt from experience or otherwise.